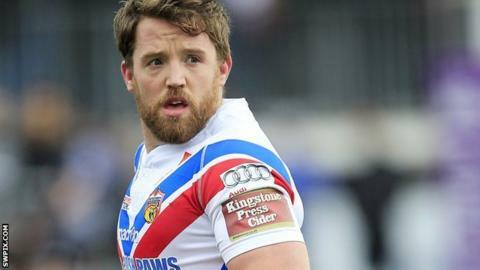 Wakefield recorded their second victory of the season to leave Huddersfield bottom of the Super League table. Jermaine McGillvary put Giants ahead, before Wildcats opened up an 18-6 lead through Tom Johnstone, Michael Sio and Reece Lyne. Two Jake Connor tries and a Danny Brough penalty tied the scores before Max Jowitt put Wakefield back in front. Aaron Murphy replied but Johnstone and Nick Scruton went over to hand Wildcats head coach Chris Chester his first win. Chester, who was appointed following Brian Smith's resignation, took charge of his first home game with his side having lost 22-4 away at Hull FC last week. But it was Huddersfield who began the brighter as Leroy Cudjoe found McGillvary on the wing and Brough converted. Wildcats produced a stirring response as they crossed the whitewash three times only to be pegged back. Jowitt's superb sidestep gave Wakefield the advantage as the game became scrappy and both Huddersfield's Larne Patrick and the hosts' Mickael Simon were sent to the sin-bin. Giants replied through Murphy, but Brough missed the conversion to draw his side level and Johnstone and Scruton claimed the victory for the Wildcats. The defeat means Huddersfield, who reached the Super League semi-finals last season, sit bottom of the table having recorded just one win all season. "Over the 80 minutes I thought we were the better side - we set the tone early doors, played some decent football, threw the ball around and defended our own line well. "They have some quality players and we knew it would be a grind and it wasn't until the last six or seven minutes that the game finally went away from Huddersfield. "Tom Johnstone (who scored two tries) looked good and young Max Jowitt had a fantastic game. "There was bags of effort from everyone and collectively we worked hard for each other. From one to 17 the attitude was first class." "We're in hole and we are where we are for a reason because we just aren't good enough at the moment. "The one thing we must do is stick together and work hard because ultimately it's effort that gets you through and gets wins. "I'm very disappointed - it's a tough one to take. It's only so long you can keep saying when we get this back and that back... the reality is we've got to stop talking and start doing. "We'll be in (training) tomorrow because we have some questions to ask." Wakefield: Jowitt, Lyne, Arundel, Gibson, Johnstone, Miller, Finn, Scruton, Moore, England, Kirkmond, Ashurst, Sio. Replacements: Simon, Annakin, Howarth, Molloy. Huddersfield: Simpson, McGillvary, Cudjoe, Connor, Murphy, Brough, Brierley, Huby, Wood, Rapira, Ta'ai, Lawrence, Hinchcliffe. Replacements: Patrick, Johnson, Leeming, Mason. Read more on What's on BBC Sport?